Between the snow storm on Saturday and the blizzard on Monday, we had brief respite on Sunday, an elusive 39° day. I seized the opportunity to wear some lighter layers and a pair of pumps. If I'm being completely honest, it would not have been warm enough for the pumps if I had to do any traversing outdoors, but since 90% of my day was spent at home in my fuzzy slippers and the only time I left was to grab a coffee with a friend, and take these photos, the pumps were okay. I love this mix of casual and the heels Lydia! You look stunning!! Love those pumps!! Stay warm lady! You look great in a relaxed outfit! Damn those pants are awesome! I adore how you've styled them as well. So cute. You make 39 degrees look good! I would have been freeeezing! Loving the idea of wearing pumps with sweatpants...comfy/chic! Those joggers are the jam! Hope you're staying warm + avoiding getting snowed in! Glad you got a bit of a break between crappy weather AND that you got to spend the majority of your time in fuzzy slippers. 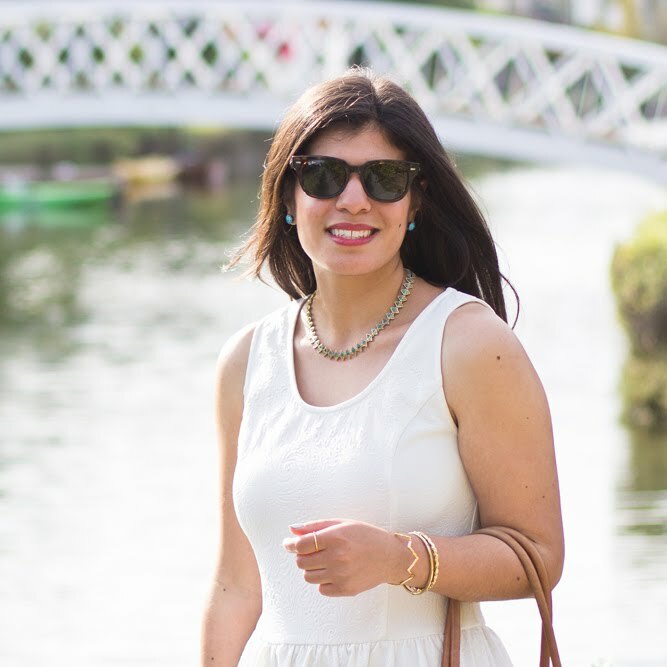 This is a great casual dressed up outfit! You have to pull out the pumps during the winter even if you suffer the cold a little bit. Cute coffee outfit! You are seriously killing those joggers! 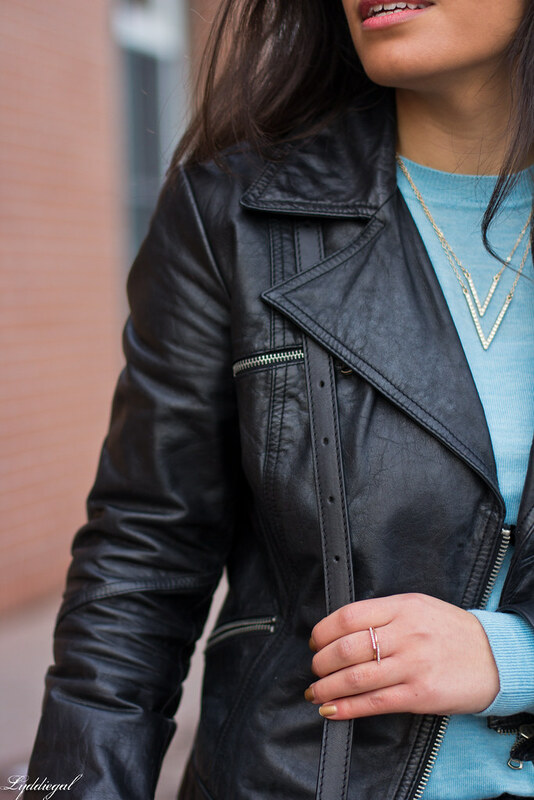 The leather jacket also gives it a fun rocker appeal! LOVE! I love those pants and how you dressed them up with a pair of heels! You look great. I love your joggers. I have been loving my joggers lately. I hope you are staying warm. these pants look so comfy you dressed them nicely with that jacket. Those joggers are amazing! Love the marled look! Glad you got a quick break between storms. Hope it isn't too bad out there! Love love those joggers! Adorable and comfy are the perfect combo! Those joggers look great on you girl!! Love this look!! Love it! 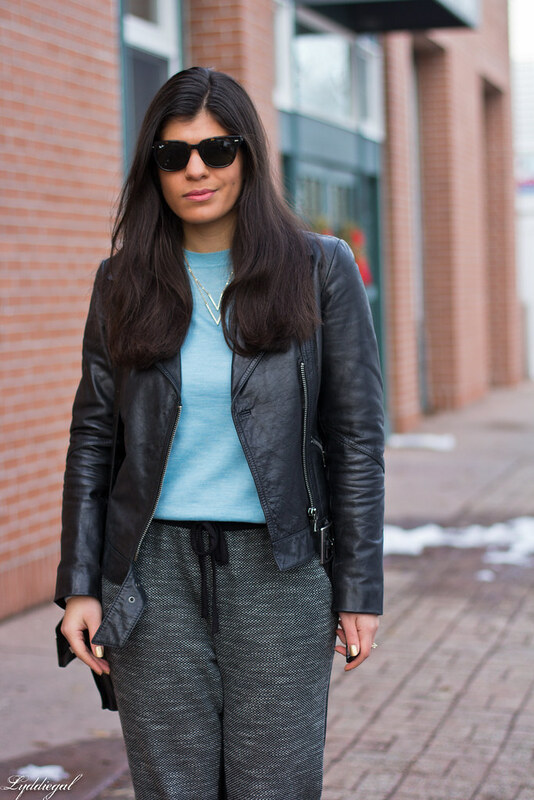 Those joggers are a-ma-zing and you styled them perfectly, you look amazing Lydia! I was lucky that I took all my pictures for the week last Sunday when it was "warm" haha. This is so cute! I love the color of your top, and the pants look fabulous on you! 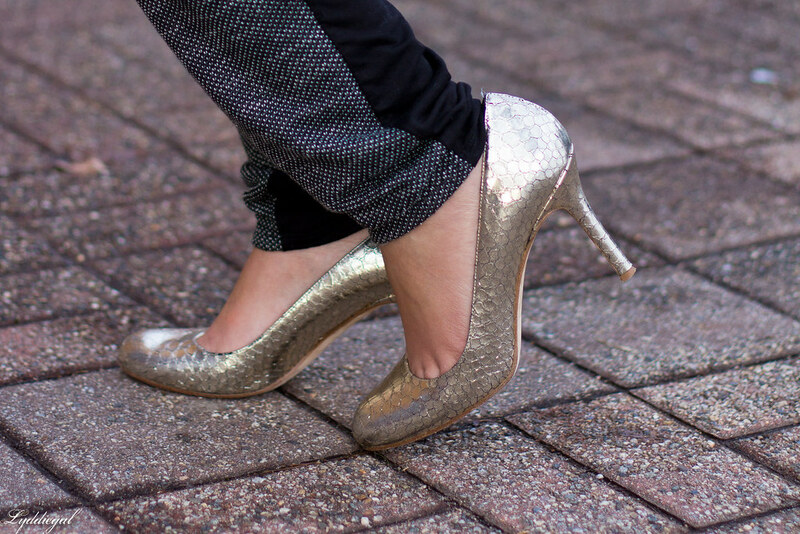 Love the pumps paired with your joggers! Such a great contrast. I know you are ready for some warmer weather. This is SUPER cute! I still have yet to find joggers that work for me! Those silver heels are stunning. I love that they look like the skin of a fish. I own similar pants to yours and I may re-create this on Spring since my Black Leather Jacket is put away for now. After so many cold days I know you just want to take ANY day that's above freezing to take a break from the boots! I love this look--those shoes and jacket really dress up those pants. Love how it all comes together. I love how cozy this outfit looks with the sweater and joggers, and then how you dressed them up with the jacket and pumps! This is such a pretty, laidback outfit for coffee. I love that you paired the joggers with those pretty KS pumps. Are they the Karolina style? It's my favorite! Very cute, I like the comfy feel of the trousers. It's like "I am relaxed but look chic".